With the withdrawal yesterday of former New York City Mayor Rudolph W. Giuliani, there remains only 1 candidate to replace George W. Bush as U.S. President who is consistently supportive of Bush's post-9/11 detention and interrogation policies. That fact suggests that voters may be far more concerned about, ashamed about, revolted by, those policies than is typically recognized. Assumption that the policies don't matter derives from polls like this one, which found last November that 40% of Americans would approve of torture "to try to get information from suspected terrorists." But it's my guess that poll results on such a highly charged question are unreliable. The politics of fear have dominated America's public discourse far too long for pollsters to expect full, honest, rational responses. "Either you're with us or you're with the terrorists," Bush declared almost immediately after the attacks of September 11, thus drawing a rhetorical line in the sand. As late as 2004, many judged it unpatriotic to oppose Bush. It seems likely then that when asked their thoughts on detention and interrogation by pollsters, many Americans may hesitate to express concerns they feel lest they be seen as "soft on terrorists" or "too hard on our troops." Is it only a coincidence that the only candidates left in the running are critics of post-9/11 practices? Will you bring back civil liberties? America seems to have lost her way. What are you going to do about that? The question surely signals disquiet, if not outrage, at the way the United States has treated captives in what the Bush Administration calls the "Global War on Terror." I used to teach the Constitution. I revere the Constitution. And as President I will obey the Constitution. Look too at what's happened in the GOP. The candidate who staked his claim on supertough counterterrorism -- Giuliani -- never came close to winning in any state. The candidate who now seems the likely nominee, Sen. John McCain, has, as we've posted here and here, been strong, steadfast, and outspoken in his condemnation not only of torture but also -- in keeping with international obligations the United States assumed on ratification of treaties like the Convention Against Torture -- cruel, inhuman, and degrading treatment. Another still standing, Mike Huckabee, goes back and forth on these issues, and in any event does not center his campaign on preserving current antiterrorism policies. Former Gov. Mitt Romney does support those policies. He wants others to endure the treatment Khalid Sheik Mohammed has, wants to double Guantánamo, too. He's the only remaining candidate to espouse these views consistently; it thus deserves note that his star also appears to be fading. Is it only a coincidence that voters seem to be gravitating toward other candidates? Even, at times, away from their traditional party and toward a party more certain to bring an end to post-9/11 excesses? Her political life started at the age of 10 after a police raid following a riot in Top Location, in which a police officer had been killed. Tambo's ailing grandfather, aged 82, was among those arrested and marched to the town square. Here the old man collapsed. She spent much of her life in exile along with her husband, Oliver Tambo. During this time she was based in London and served as the ANC's a founder of the Afro-Asian Solidarity Movement and the Pan-African Women's Organisation. The couple returned to South Africa in 1990; Oliver died 3 years later. Upon the death of the woman known as "Ma Tambo" or "Mama Adelaide, "South Africa's 1st post-apartheid President, Nelson Mandela, "who shared her birthday, said he mourned the 'passing away of a close personal friend, a comrade and one of the great heroines of our nation.'" the enthusiasm of all present, save a few disappointed politicians, knew no bounds, and for several moments the scene was grand and impressive beyond description. No attempt was made to suppress the applause which came from all sides, every one feeling that the occasion justified the fullest expression of approbation and joy. The 13th Amendment -- one of IntLawGrrls' Legal Wonders of the World -- would take effect in December of the same year. The year was 1803 and a rag-tag group of freedom fighters, led by the charismatic Toussaint Louverture, fought with unyielding strength and conviction against Napoleon’s army. The army was sent to regain control of a rebellious island of slaves. A verdant land blessed with fertile soil and abundant natural resources, Haiti had once been the richest jewel in Napoleon’s crown. Exports of Haitian sugar, cotton and coffee in the past accounted for one-half of all of metropolitan France’s foreign trade. Napoleon sought to retain his pearl of great price, but the Haitian Revolution (1791-1803) would foreshadow his cataclysmic loss at Waterloo 12 years later. On January 1, 1804, founding father Jean-Jacques Dessalines declared the independence of Ayiti (a Taino Indian word meaning “mountainous country”), which became only the 2d free state in the Western Hemisphere, and the only successful slave revolution in modern history. But what the rebels failed to realize was that their biggest battle lay before them. Terrified these newly freed slaves would give “big ideas” to America’s own shackled masses, U.S. President Thomas Jefferson refused to recognize the newly independent nation (despite having aided it in the struggle). 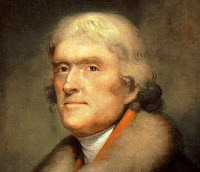 Instead, Jefferson imposed a trade embargo on Haiti, which economically crippled the newborn republic for years to come. Few Americans know of Jefferson’s role in the early history of Haiti, but Haitian children are fed the story with our mother’s milk. With the stroke of a pen, Jefferson achieved what Napoleon’s army could not. Haitians won the battle but lost the war in part because Jefferson used the tourniquet of a trade embargo to cut off the island. Trade is powerful. Managed well, free trade can bring peace, advancement and prosperity. And its absence brings economic marginalization from which a country may never recover. In 1941, Roosevelt and Churchill secretly met on a ship off the coast of Newfoundland to chart the course for freedom post World War II. They envisioned a new world order where free trade, peace and prosperity were the guiding principles. The Atlantic Charter proclaimed their “desire to bring about the fullest collaboration between all nations in the economic field with the object of securing, for all, improved labor standards, economic advancement and social security”. Roosevelt and Churchill ‘s musings gave birth to the plethora of international economic institutions created in the late 1940s—from the Bretton Woods Institutions to the General Agreement on Tariffs and Trade. The GATT self-consciously sought to harness the power of trade to create a more just world order. In the words of the United States’ principal negotiator at the time “the questions with which the charter is really concerned are whether there is to be economic peace or economic war, whether nations are to be drawn together or torn apart, whether men are to have work or to be idle, whether their families are to eat or go hungry, whether their children are to face the future with confidence or with fear.” Trade was too powerful an instrument to be left to the unilateral will of any single nation. Henceforth, trade would have rules. Even if it were found that the embargo nullified or impaired benefits accruing to Nicaragua independent of whether or not it was justified under Article XXI, GATT members could] take no decision ... that would re-establish the balance of advantages which had accrued to Nicaragua ... prior to the embargo. There is something troubling about a decision that at least hints at impermissibility, but then claims there is nothing to be done about it. But as presently conceived, Article XXI provides no leeway. I call for a re-examination of Article XXI in my piece Terror on the High Seas: The Trade and Development Implications of U.S. National Security Measures in part to deal with this dilemma. Can free trade truly end war? Standing alone, the answer is no. But there is much that free trade can do in conjunction with other efforts. We must begin to explore and exploit that potential for the greater good. One thing we know for sure: We need an end to war—by any means at our disposal. I started this series with a confession: At times, I worry that in straying from a career focused on preserving individual rights through direct representation of “real people,” I have not fulfilled the longing of my nine year old self to become the “international Thurgood Marshall” (a patriotic 9 year old me at right). But on good days, I recognize that law and justice represent an infinite line, and at whatever point in the continuum we intervene to make a worthy contribution is a job well done. Thurgood Marshall surely would have agreed. Where in the world has one ever seen a nation that erects memorials to immortalize its own shame? Only the Germans had the bravery and the humility. ... 1972, in Derry, the 2d largest city in the North of Ireland, British paratroopers opened fire on unarmed civil rights demonstrators. In the end 14 persons died, all but 1 on the day, and others were wounded. In the Associated Press photo at left, Father Edward Daly waves a white hankerchief as others carry a casualty out of the line of fire. It is the lesson of Bloody Sunday that, from Fallujah to Nasiriyah, from Mosul to Baghdad, we can expect violence every day that foreign troops remain on Iraq's soil. We can hope for no positive change without a full withdrawal of coalition forces -- a solution called for this week by Sen. Edward M. Kennedy, D-Mass., and Rep. Lynn Woolsey, D-Petaluma -- so that Iraqis may take the lead in their own affairs. Based on Bush's second inaugural address, however, we can look only to four more years of unlearned and ineffective policy. And so we can muster no optimism about today's elections in Iraq. ... 1913, Britain's House of Lords rejected a bill that would have accorded to Ireland Home Rule, a modicum of self-government. The 6 French nationals convicted in Chad of trying to kidnap to Europe more than a hundred children they said were Darfurian orphans -- but who, as we've posted, we re in fact Chadian children with families -- received "substitute" sentences from a French judge today. A Chadian court had sentenced Zoe's Ark workers Eric Breteau, Emilie Lelouch, Alain Péligat, Philippe van Winkelberg, Dominique Aubry, and Nadia Merimi to 8 years of forced labor. They were then transferred, pursuant to a France-Chad treaty signed in 1976, back to Paris. There le tribunal correctionnel de Créteil gave them, as a substitute, 8 years in French prison. The court did not seem to have been moved by defense counsel's argument "stigmatizing" the Chadian judgment as having been "produced by a 'totalitarian' country." ... 1978 (30 years ago today), Sweden became the world's 1st country to ban aerosol sprays, which contain chlorofluorocarbons believed to deplete the ozone layer and thus harm the global environment. ... 2007, an Associated Press story entitled Mujeres aumentan presencia en Corte Interamericana reported that the Inter-American Court of Human Rights (right) began its 1st session of the year with 3 new judges. In an historic first, the panel comprised 3 women judges: Margarette May Macaulay of Jamaica and Rhadys Abreu Blondet of the Dominican Republic, both new, who joined the lone woman already on the Court, Cecilia Medina Quiroga of Chile. Just a couple of weeks after I designated the conflict in the Democratic Republic of Congo (DRC) as the most underrecognized international crisis point of 2007 here, the Congolese government reached a peace agreement with some of the militias operating in Eastern Congo. Hopefully this agreement will lead to real disarmament, demobilization and conflict reduction in the DRC, where millions have died in the most deadly conflict since World War II. However, only a week later, the New York Times reports that a serious breach of the ceasefire has already occurred. From an international law perspective, it’s interesting to note that an amnesty for war crimes and crimes against humanity was not part of the deal. It’s unclear where this leaves Laurent Nkunda, the leader of the CNDP militia, for whom the DRC issued an international arrest warrant several years ago. The latest report is that the DRC government has not renewed the arrest warrant and that Nkunda may be granted an amnesty. However, even if granted, it is doubtful that such an amnesty would be understood to extend to the International Criminal Court, which is investigating the situation in the DRC and will begin its first trial, the prosecution of a DRC militia leader, this year. At this point, skirmishes between the militias that are still at a face-off in the region seem to be a more determinative factor in the status of the peace agreement than any more remote fear of prosecution. Nonetheless, it is hard to imagine that Nkunda will proceed with demobilizing his troops without an assurance that he will not end up facing charges when they no longer have his back. It's IntLawGrrls' great pleasure to welcome Judith Weingarten (left). She's guest blogging today, to make the "case for Hillary Clinton" in this 2008 Democratic presidential nomination contest by means of her post below. A long and loyal reader of IntLawGrrls, Judith studied Classical Archaeology at the University of Oxford (M. Litt.) She is a member of the British School of Athens, and for many years has been involved in archeological excavations in Greece and on the island of Crete. Author of The Chronicle of Zenobia: The Rebel Queen (2006), she publishes and lectures frequently about early Greek archeology and the ancient Near East. Judith divides her "home-time," as she puts it, "between the wonderful city of Amsterdam and a mountain village on the edge of a nature reserve in Tuscany, Italy." Check out her blog, Zenobia: Empress of the East. I thank Diane Marie Amann for inviting me to put the case for Hillary Clinton. My timing isn’t perfect. But the results from S. Carolina make it vital for Democrats to examine our two leading candidates with extra care. Why do I prefer Hillary’s policies and think she will do a better job than Obama? I needn’t repeat what the NY Times has said in endorsing her for the Dem nominee. Instead, I’d like to bring up a few issues that IntLawGrrls might want to think about. 1st, it is said that Barack Obama’s election would change the world’s perception of America at a stroke. Believe me, the election of any Democrat would bring a giant sigh of relief among all our former friends and allies. After that, they will wait to see our policies. So it will come back to policies – accomplished, not promised. 2d, it’s said Hillary is divisive, she is hated, and won’t be able to get things done. Yet she has worked effectively in the Senate, promoted a stream of legislation, and proved that she can work with moderate Republicans to get results. Similarly, when overwhelmingly re-elected to the Senate, she carried much of Republican upstate New York, persuading independents and moderate Republicans to back her. Some people do hate her. So what? The 30% of Americans who still think George W Bush is doing a good job will never change, never like her, and go on hating Democrats; probably as many Dems loathed GWB but he was (re? )elected in 2004 anyway. A personal impression: I heard HRC speak at a fund-raising luncheon when running for re-election and I happened to be in New York. The charge that ‘she’s a robot’ is nonsense. She was a warm, funny speaker and the 300 women and men in the audience responded fervently. We heard a winner. I don’t doubt she has ‘charisma’, but I suspect she learned, as did most women of her generation, not to let it show too much. She’ll undo that, I think, as she swings into the election. 3d, she hasn’t really had her own Experience (Oh, 'Grrls, should we be denigrating good work because it’s done by a Wife?). As First Lady, HRC travelled the world, meeting with leaders and oppositions, while helping to launch such initiatives as the Children’s Health Insurance Program and the National Campaign to Prevent Teen Pregnancy. Do you remember her speech in Beijing at the UN World Conference on Women in 1995 (despite the Chinese government and some American staffers trying to shut her up)? – when she declared that "human rights are women's rights and women's rights are human rights". If you’ve forgotten, take a moment to read about it at the link above. Now in her 2d term as Senator, she has built up an impressive legislative record on progressive issues – some high profile (e.g., the recent battle with GWB over extending the Children’s Health Insurance Program ) but much of it gritty, unglamorous, plain hard work. She has introduced, sponsored and co-sponsored legislation on Women’s issues, Education, Health care (with the scars to prove it), Civil rights, and joined other senators in submitting a friend of the court brief supporting U. of Michigan in its court battle to maintain affirmative action in 2003. On the home front, a Democratic President will have the monumental task of putting back together a competent, problem-solving government, while keeping America this side of fiscal bankruptcy. Where does one even start? How about by knowing how the national government works (or used to work)? No pep talks, please, or hands-off management. Now, Iraq. I know, Obama always opposed the illegal, immoral, and ruinous war. But he didn’t have to vote for or against it since he wasn’t in the Senate at the time. Now he is in the Senate and has voted the same as HRC on Iraq funding and war-related bills. No one wants deny our troops when they are ‘in harm’s way’(a weak euphemism for killing and being killed). Anyway, that was then. Now both candidates want to get out. Whoever takes this on had better be tough. And knowledgeable. HRC is the the 1st New York Senator to serve on the Senate Armed Services Committee . She has introduced two relevant bills in 2007, the Congressional Oversight of Iraq Agreements Act – to require the President to get Congressional approval for any bilateral agreement extending the U.S. military commitment, and the Iraq Troop Protection and Reduction Act – to halt the President’s escalation and to end the war before he leaves office. Hillary is a learner. Just as she learned from the collapse of her first health coverage plan – and has now crafted a plan that could get the job done – she has come to the right side on Iraq (and hands up, all of you, who swear you had no doubts even in the beginning. Good for you. It took me a little longer). Even with HRC as commander-in-chief, it’s going to be incredibly difficult, politically dangerous, and (I’m sorry to re-emphasize) very bloody. My last point is electability. I do not believe Obama can be elected. I need not tell IntLawGrrls how critical it is that the next President is a Democrat (think of those two Supreme Court seats coming up, and tremble). But we want Change, you say. The election of the first woman President is not a Change? We, too, have waited long enough. mother, Sidonie, had the greater influence on the girl and taught her the importance of being a woman. Sidonie was the type who shocked the neighbors by refusing to wear mourning clothes when her husband died and who read Corneille at mass. At age 20 the daughter married Henri Gauthier-Villars, a Parisian editor who wrote potboilers under the pseudonym "M. Willy." He encouraged his bride to write, then published her "Claudine" stories of school life under his own name, bringing wealth and fame to himself. "She never liked writing, so M. Willy locked her in a room until she turned out something. After thirteen years of such apprenticeship," the Times wrote, she "became disillusioned and divorced him." The woman eventually known only by the surname she was given at birth, Colette (above left), published one of her best known novels, Cheri, in 1920. Though never admitted to the prestigious Académie française -- because, as the Times matter-of-factly explained at her death in 1954, "it is for men only" -- Colette was admitted to the Belgian Academy of French Language and Literature, was an honorary associate of the American National Institute of Arts and Letters, and became the 2d woman in history to be made a grand officer of France's Légion d'honneur. (The 1982 Charter, incidentally, is among the IntLawGrrls' Legal Wonders of the World.) In the majority were Chief Justice Robert George Brian Dickson and Justices Jean-Marie Philémon Joseph Beetz, Willard Zebedee Estey, Antonio Lamer, and Bertha Wilson (As we've posted, Wilson (right) was the 1st woman ever to serve on the Court). Dissenting were Justices William Rogers McIntyre and Gérard La Forest. Employing a methodology I've discussed here and here, the Court looked to numerous foreign decisions as aids to interpretation of its Constitution. Among them: Roe v. Wade (U.S. 1973), which, as posted earlier this month, just marked its 35th anniversary; Paton v. United Kingdom (Eur. Comm'n H. Rts. 1980); and the West German Abortion Decision (Fed. Rep. Ger. 1975). ... 1969, U.S. Rep. Linda Sánchez (D-Cal.) was born in Orange, California. isolated 23 hours a day in their cells, denied radio and television broadcasts, and prevented from earning a GED (General Education Diploma) or taking special education classes. They ate alone and could not make telephone calls except in emergencies or when related to legal representation. Unable to speak or socialize directly with other inmates, they stared at the unpainted, concrete, and windowless walls onto which nothing could be posted. Except for the occasional touch of an officer’s hand as they were handcuffed and chained to leave their cells, they had no contact with other human beings. Although prisoners could “graduate” out of [this special unit], the duration of their stay—beyond the minimum requirement of ninety days—was at the discretion of prison administrators, and most did not graduate. In this already severely restricted environment, the new  policy categorically prohibited access to magazines, newspapers, or books, except paperbacks from the prison library—called “leisure books” in “[the unit’s] Rules and Regulations”—and books of a legal or religious nature. Prison officials offered two reasons for this sweeping restriction of prisoners’ First Amendment rights. Newspapers, they said, could be wound up, turned into projectiles, used as night sticks, and deployed to make fires and hide contraband. Moreover, these officials argued, the deprivation of personal photographs and secular periodicals serves the goal of rehabilitation. Prisoners like to read about current events and look at photographs of their loved ones. Take these things away, the theory went, and recalcitrant prisoners, those “who have few other privileges to lose,” would behave. Meanwhile, across an ocean, in a former dictatorship where “[p]risoners sleep on hard pallets more than a dozen to a cell and are held to a strict schedule of work and other activities from dawn to light-out[,]” inmates are learning that “they can be productive, that they aren’t useless scum of society”. In the prison where rehabilitation through dance began, gangs have been broken up, “weekly outbreaks of violence have subsided, inmates’ health has improved and recidivism rates are down dramatically”. This country? The Philippines, where the dance craze has spread to other prisons, thanks, in part, to this YouTube video, in which 1500 prisoners groove together. Back in the United States, as Dayan's essay reminds us, on one day in 2006 some members of the Supreme Court expressed extreme dismay over Salim Hamdan’s being denied the right to be present at his trial before a military commission. That was just one day after members of the Court -- including some who'd expressed concern in Hamdan -- handed down the retrograde judgment upholding the denial of anything that might show certain prisoners that they are still present as human beings in society. ... 1945, the Soviet Union's Red Army liberated Auschwitz. Located in southwestern Poland, the 5-year-old camp was the largest of the concentration camps run by the Nazis. 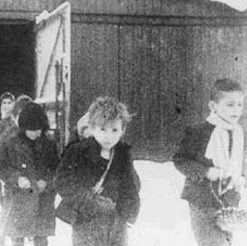 In the photo at left, child detainees who had survived walk out of their barracks at the time of liberation. ... 1416, for the 1st time a European governmental entity, the Republic of Dubrovnik, outlawed slavery. ... 1949, U.S. Rep. Marilyn Musgrave (R-Colo.) was born in Greeley, Colorado. By a 10-7 margin the Grand Chamber of the European Court of Human Rights has ruled that France's refusal to permit a lesbian from adopting a child violated Europe's Convention on Human Rights. E.B., a teacher in France's national nursery school system, had been in a longterm relationship with R, a psychologist. After the Conseil d'Etat refused to grant E.B. an authorization to adopt -- France reasoned that the child would suffer from lack of a "paternal referent," E.B. sought relief from the ECHR. previously held that the notion of “private life” ... is a broad concept which encompasses, inter alia, the right to establish and develop relationships with other human beings, the right to “personal development” or the right to self-determination as such. It encompasses elements such as names, gender identification, sexual orientation and sexual life, which fall within the personal sphere..., and the right to respect for both the decisions to have and not to have a child. ► Article 14, freedom from discrimination -- this was held to apply even though the provision does not explicitly protect individuals from discrimination on account of sexual orientation. Voting with the majority in favor of E.B. 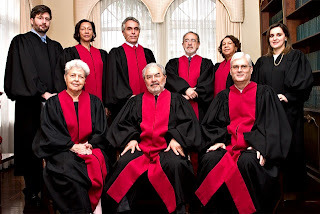 were Judges: Nicolas Bratza, ECHR Vice President (Britain); Peer Lorenzen (Denmark); Françoise Tulkens (Belgium); Ireneu Cabral Barreto (Portugal); Elisabeth Steiner (Austria); Elisabet Fura-Sandström (Sweden); Egbert Myjer (Netherlands); Dragoljub Popović (Serbia); and Sverre Erik Jebens (Norway). Dissenting were Judges: Jean-Paul Costa, ECHR President (France); Boštjan Zupančič (Slovenia); Loukis Loucaides (Cyprus); Antonella Mularoni (San Marino); Riza Türmen (Turkey); Mindia Ugrekhelidze (Georgia); and Danutė Jočienė (Lithuania). 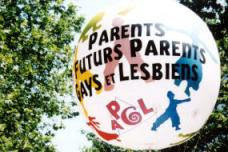 Even as a spokesman for France's Association of Gay and Lesbian Parents (logo on balloon in photo) rejoiced that "'homosexuals would no longer have to hide themselves in order to adopt,'" gays and lesbians in Belgium warned against premature celebration. Le Monde reported: "Their reservations can be explained by a stark observation: in their country, where homosexuals have not only the right to marry but also, since May 2006, to adopt, not one couple has managed to open a file for international adoption. Belgium's 2006 law, they said, is an "'empty vessel.'" ... 1998 (10 years ago today), "With eyes narrowed and one index finger stabbing the air, President Clinton angrily denied today that he had had sexual relations with Monica S. Lewinsky, the former White House intern whose tape-recorded accounts of an affair with him now threaten his Presidency," the New York Times then reported. Bill Clinton said at the internationally reported Washington press conference at which he delivered an "emphatic denial": '''I did not have sexual relations with that woman, Miss Lewinsky.'" On his last full day in office 2 years later, President Clinton, who had survived an impeachment trial before the U.S. Senate, accepted a deal in order to settle the matter; in so doing, he admitted telling falsehoods under oath. ... 1977, the Vatican affirmed its ban on admitting women to the priesthood of the Roman Catholic Church. ► Between September and December 2007, over 45,000 Iraqis returned from Syria to Iraq. Almost 70 percent returned not because of improved security, but because they could not afford to live in Syria, as they faced stricter visa policies and difficulty finding work. ► As reported here, Syria introduced visa restrictions for Iraqis in October 2007. Prior to these restrictions, an estimated 2,000 Iraqis entered Syria each day. Jordan closed its borders in 2005, and Saudi Arabia is building a 560-mile border fence with Iraq to keep out undocumented immigrants. In Lebanon, Iraqis have no legal status; the government detains them indefinitely until they agree to return to Iraq. ► Of an estimated 2.2 million externally displaced, only 5,000 Iraqis had been resettled in third countries by December 2007. Although the United States allocated space for 7,000 Iraqi refugees and the U.N. High Commissioner for Refugees (UNHCR) referred over 10,000 Iraqis to the U.S., only 1,608 Iraqis were resettled to the United States during fiscal year 2007. ► Iraqi asylum claims in the 36 industrialized countries that report data to UNHCR more than doubled in the first six months of 2007 compared to the first six months of 2006. ► UNHCR estimates that 60,000 Iraqis per month, or just over 80 people each hour, are being displaced within Iraq. In the words of Newland (right) and O'Donnell, "the international response to the humanitarian crisis resulting from the war in Iraq is, thus far, wholly inadequate . . . [U]rgent action, beginning today, is needed to build toward an enduring, comprehensive solution . ..."
... 1882, Adeline Virginia Stephen was born in London. She grew up in a literary household -- her father was an editor who once had been married to the daughter of William Makepeace Thackeray, author of the novel Vanity Fair. After studying at Kings College she became part of the Bloomsbury Group. In 1912 she married Leonard Woolf and took his surname to become Virginia Woolf (right). Under that name she would write many novels and other works. Personal favorite: her 1929 essay "A Room of One's Own," "a discussion of women’s writing and its historical economic and social underpinning." Afflicted with psychiatric disorders throughout her life, she died in 1941, drowning herself in a river near her country home. Many thousands of people endured similar experiences under Alberta's Sterilization Act. In 1928, Alberta became one of two provinces and twenty-eight states in North Am erica to pass such legislation. The Act was based on the principals of eugenics, meaning "good birth". It was believed that if only those people with desirable genes bore children, the human race as a whole would improve. The Alberta government and pressure groups including the United Farm Women of Alberta sought to limit the reproduction of many kinds of people, including visible minorities and the "feeble-minded". They attributed much of the rise of crime, poverty, alcoholism and other vices to these people. Almost 3 000 people were sterilized under Alberta's Sterilization Act. Many more were not released because they would not consent to sterilization. Even in 1972, the year the Act was finally repealed, fifty-five people were sterilized for their "danger of transmission to the progeny of mental deficiency" and for being "incapable of intelligent parenthood". For readers in the United States, the case calls to mind the similar challenge that Carrie Buck (left) brought before the Supreme Court in 1927. Her unsuccessful suit prompted Justice Oliver Wendell Holmes, Jr., to comment on behalf of 8 of the Court's 9 Justices: "Three generations of imbeciles are enough." What Happens to Guantánamo Detainees When the 'War on Terrorism' Is Over? 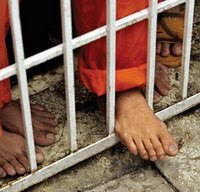 University of Pittsburgh’s excellent JURIST blog reports on a draft bill before the Iraqi parliament which would allow for the release of approximately 5,000 current detainees in Iraq and provide those released with an amnesty. Although there are some quite severe difficulties with the Bill – not least the fact that excludes from its provisions all those in US custody and those imprisoned for, inter alia, adultery and homosexuality – and the fact that it is not targeted as a response to terrorism-related detentions, the Bill’s presentation does raise an important question: what will ‘we’ do with those detained on suspicion of terrorist activities when the ‘War on Terrorism’ ends? 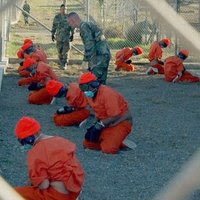 To take Guantanamo Bay as an example, the United States has repeatedly asserted its desire to close the detention facility there but cites concerns about the destination and future conduct of detainees, including reluctance by ‘home states’ to have their citizens repatriated, as one of the major obstacles to closure. In addition, any detainees who may have been subjected to unlawful treatment in detention including torture clearly pose a litigation risk to the United States. The present case involves the method of detaining and interrogating alleged enemy combatants during a war -- a matter with grave national security implications. Permitting damages suits by detainees may allow our enemies to "obstruct the foreign policy of our government." Moreover, dealing with foreign relations is primarily delegated to the executive and legislative branches ... and creating a damages action could produce "multifarious pronouncements by various departments." Nor does our government's unanimous condemnation of torture answer this concern, since where to draw that line is the subject of acrimonious debate between the executive and legislative branches. Treatment of detainees is inexorably linked to our effort to prevail in the terrorists' war against us, including our ability to work with foreign governments in capturing and detaining known and potential terrorists. Judicial involvement in this delicate area could undermine these military and diplomatic efforts and lead to "embarrassment of our government abroad." Accordingly, the democratic French, who had greatly contributed to the theory and practice of human rights, committed torture. And because the French had tortured, they could not put their enemies on trial; instead, they summarily executed them. Their efforts to sweep these atrocities under the rug for many years led to the loss of their self-respect, as well as the respect of many others, starting with the Arab-islamic world. Torture may have helped the French win the battle of Algiers, but their policy of abuse led to many negatives, including increased domestic criticism and loss of reputation in the world; meanwhile their enemies failed to lessen their struggle. The Bush policy toward enemy detainees replicates much of this French experience. than domestic factors, although the role of the ICRC is not without importance. The situation is not totally new, not only by comparison to France in Algeria. During the Cold War, the United States then too spoke of freedom and human rights and the rule of law but acted in the shadows to overthrow elected governments and back murderous allies, as in Chile and Guatemala. But to paraphrase Sartre..., why should Americans go to such trouble to be patriots if their country in reality stands for torture and other serious violations of fundamental human rights? The French have much to say on the subject. A law such as that proposed in Iraq is unlikely to solve the problems to be faced by the United States at the ‘cessation of hostilities’ when even its (shaky) international humanitarian law grounds for detention are gone, but it may well become time to start thinking about strategy. Although the candidates for presidential nominations from both the GOP and the Democratic party have address Guantanamo and the ‘War on Terrorism’, none appear to have come up with a sustained strategy to avoid a repetition of what Forsyth might call ‘the French lesson’. Cross-posted from the blog of the Centre for Criminal Justice and Human Rights, University College Cork. ... 2003, in a governmental reorganization undertaken in the wake of the terrorist attacks of September 11, 2001, the United States established the Office of the Secretary of Homeland Security, a precursor to final establishment of the new Department of Homeland Security authorized by Congress the year before. Today the department is home to a host of governmental agencies, among them the Transportation Safety Administration, Immigration and Customs Enforcement, Federal Emergency Management Agencies, and U.S. Coast Guard. A week ago Kenya's Justice Minister, Martha Karua (right), predicted the political crisis that's roiled her country in the weeks following a disputed Presidential election would settle down. Karua told the BBC she expected that "cooler heads" would prevail: "We expect that eventually everybody will come to their senses, realise that we've got to learn to live with each other." Sadly, her prediction's proved premature. 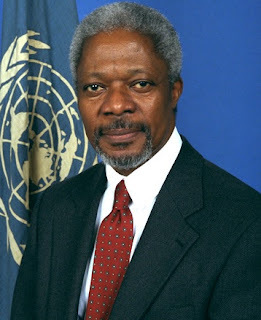 Here's the latest news from Nairobi: "Nine people were hacked or burned to death in new violence linked to Kenya's political crisis on Tuesday, as former UN secretary general Kofi Annan arrived to revive mediation efforts." Since violence erupted in the wake of the December 27, 2007, balloting, more than 700 Kenyans have been killed. Another 250,000 have fled their homes. Opposition leader Raila Odinga's called it a "constitutional crisis," a contention that our colleague Mary Dudziak, author of a forthcoming book on Thurgood Marshall's role in drafting the Kenya Constitution, has analyzed here. Odinga and his rival, incumbent President Mwai Kibaki, came together in the same room last week for the 1st time since the election, to vote on who'd become Speaker of Parliament. Though Odinga's Orange Democratic Movement won, the vote was close, and the victory did not stop the turmoil. Indeed, yesterday an Odinga spokesman said the movement had "sent a formal complaint to the International Criminal Court in The Hague notifying the panel about the charges that authorities committed crimes against humanity during the crackdown on demonstrations" -- a charge the government met by saying it'd be complaining to the ICC that the oppostion was "involved in planning 'mass genocide.'" Annan, a 2001 Nobel Peace laureate (right), was to have arrived in Nairobi to launch mediation talks a week ago but delayed on account of flu. Now that he's there, he's got his work cut out for him. ... 1997, Madeleine Albright was sworn in as the United States' 64th Secretary of State, the 1st woman ever to hold that position. Albright, who'd been born Marie Jana Korbelová in 1937 in Prague, Czechoslovakia, previously had served as the U.S. Permanent Representative to the United Nations, as a member of President Bill Clinton's Cabinet, and as a member of the United States' National Security Council. ... 1912, the International Opium Convention was signed at The Hague, Netherlands. 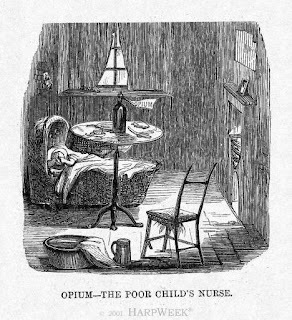 Aimed at illicit narcotics derived from poppies -- as shown in the 1859 Harper's Weekly editorial cartoon at right, opiates that were in "widespread use" in the 19th century -- this was the 1st multilateral drug control pact. 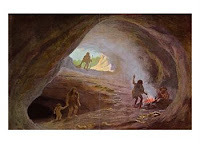 Probably since the first cavemen crawled out of their burrows to exchange firewood for leopard skins, trading relationships have led to strife and war (credit). Prof. Antony Anghie’s work traces the birth of international law—at least in part—to the need to regulate these relationships. And my own recent scholarship focuses on the Berlin Conference of 1884, an attempt by European powers to avert a trade-related war by “peaceably” carving up the African continent into trade zones. Thus, war and trade have always been linked, but the civilizing influence of time was said to have moved us away from the raw grab for power and riches so prevalent in earlier centuries. Trade would now be a source of peace rather than strife (so claims Thomas Friedman in his Golden Arches Theory of Conflict Prevention— “No two countries that both have a McDonald’s have ever fought a war against each other”). In my last post, I asked whether that was possible: Can free trade end war? Prof. Colin Picker’s article, Trade and Security: Empiricism, Change, Emotion & Relevancy suggests not. Picker maintains the “new flavors” of armed conflict are such that trade policy will have little influence on them. In post-Cold War conflicts, he argues, economic factors are not the source of the conflict so much as ethnic or religious tensions. Given that reality, trade policy is a poor substitute for a more robust peace policy, and trade officials are poorly equipped to handle the problem in any case. Belgrade is a modern city integrated with Western Europe, with a population that wants to be part of today's main global trends . . . Once NATO turned out the lights in Belgrade, and shut down the power grids and the economy, Belgrade's citizens demanded an end to the war. It's that simple. Not only did NATO soldiers not want to die for Kosovo -- neither did the Serbs of Belgrade. They wanted to be part of the world, more than they wanted Kosovo to be part of them. They wanted McDonald's re-opened, much more than they wanted Kosovo re-occupied. A few years ago, I read Thomas Barnett’s, The Pentagon’s New Map: War and Peace in the Twenty-first Century and was struck by his charge that modern instabilities in the world order stem almost exclusively from those countries left out of the “functioning core” of globalization. Rather than de-linking trade policy from modern wars, trade policy should be more conscious of the nexus between trade and peace. If we fail to bring the prosperity trade engenders to every corner of the globe, then we risk having those neglected and long-forgotten castaways visit us in our own backyards. In my next post, I want to explore the question of how might we organize trade policy to address some modern conflicts. Polar bears have been much in the world's news lately. One of the females, Vera, staggered through the enclosure with her cub, still blind after birth, in her mouth, dropping it on the stone surface several times. 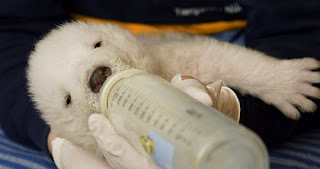 Zoo personnel removed the cub after concluding that the bear was incapable of raising her own young. A short time earlier another female, Vilma, attacked her twin cubs and promptly ate them. [D]espite public perception, polar bears in zoos endure a wretched existence. 'Keeping polar bears in enclosures is as unnatural for the species as locking a child in a tiny room for the rest of his life,' says Rüdiger Schmiedel, director of the German Bear Foundation. Yet these Eisbären have little hope of good prospects in the wild. Our colleague Holly Doremus (left) explains in "Polar Bear Politics," her excellent Slate op-ed: "Human actions now are predictably committing the bear to future peril." The culprit is climate change; the warming of polar ice caps poses a genuine threat to these bears' existence. "[A]nticipated reductions in sea ice will put the polar bear at grave risk of extinction by the middle of this century," Doremus writes, citing "extensive peer review" studies and a 2007 U.S. Geological Survey report. Despite these data, some oppose further polar bear protection. They include Mary Simon (below left), a leader of Canada's Inuit community, who's contended that more protection would mean "hunting restrictions" that "would hurt" the indigenous people's "livelihood." Further south, in Washington, D.C., last week Bush administration "officials defended plans for oil drilling in the Chukchi Sea off northwestern Alaska, telling lawmakers that it would not harm polar bears, already threatened by global warming." The administration says a 1972 federal statute, the Marine Mammal Protection Act, already "provides adequate safeguards to polar bears from oil exploration accidents such as oil spills," and nothing more needs to be done. But some members of Congress don't see it that way, and they're calling for added protection via another environmental statute, the 1973 Endangered Species Act (ESA). The arguments against listing the polar bear don't stand up either legally or as a matter of policy. The polar bear fits the law's definition of a threatened species. Although the ESA cannot solve the problem of global warming, it might help push the nation toward a more effective solution. Listing ... might help the bear in small ways, by forcing offshore oil interests in the arctic to take better account of their environmental impacts. ... 1963 (45 years ago today), the Treaty between the Republic of France and the Federal Republic of Germany on French-German Cooperation, better known as the Elysée Treaty, was signed in Paris by Président Charles de Gaulle and Bundeskanzeller Konrad Adenauer. The treaty aimed to "brin[g] an end to the age-old rivalries" between the French and German peoples and to stress "the solidarity which unites the two peoples both with respect to their security and with respect to their economic and cultural development." In a historic resolution of a fiercely controversial issue, the Court drafted a new set of national guidelines that will result in broadly liberalized anti-abortion laws in 46 states but will not abolish restrictions altogether. As we've posted, in succeeding judgments the Court has cut back on the ruling in this case, argued for petitioner by a 26-year-old attorney, Sarah Weddington (above). 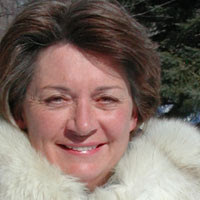 ... 1962, U.S. Rep. Melissa Bean (D-Ill.) was born in Chicago.